Dan & Jay review this week’s episode of Lucha Underground, the final one before their three-part Ultima Lucha Dos season finale. Dan also addresses the controversy of results being revealed online through dirtsheets and social media prior to the actual show being aired. Dan also weighs in on the friendly debate between WLW Studio stablemates, Mike Noringonger and Stubs McBeepster: to beard or not to beard? All that, another edition of My Musical Journey, and more! If your top babyface is the most hated man in the company, you’re doing something wrong. The Smartest Man Not In Pro Wrestling has identified what Roman Reigns is missing. He also continues counting down the WrestleMania matches of Andre the Giant & Tito Santana (we’re up to No. 5). 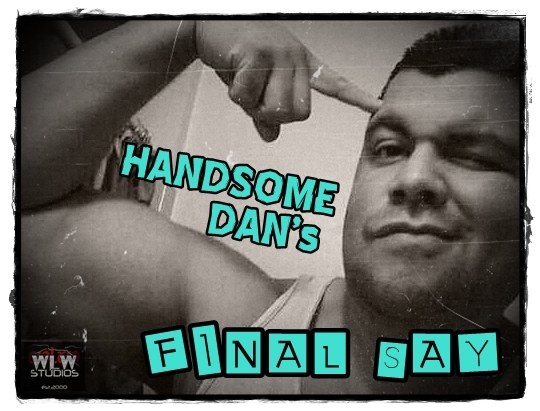 PLUS, WLW’s “Lucha Liaison” Jay Baca joins Handsome Dan to discuss this week’s episode of Lucha Underground. All this and more as we #RaiseYourWrestlingIQ. “Lucha Liaison” Jay Baca joins Handsome Dan to review “Aztec Warfare” from this week’s episode of Lucha Underground, then stays to discuss the legacy of soon-to-be WWE Hall of Famer, Sting. Plus, two more matches in the WrestleMania careers of Andre the Giant and Tito Santana are reviewed. All that and more on this week’s podcast. Time to raise your IQ! “Lucha Liaison” Jay Baca joins Handsome Dan to talk about the way championships in wrestling have lost their value, they speculate about the REAL reason behind Vince McMahon bringing his son Shane back, PLUS, find out why this week’s episode of Lucha Underground has been Dan’s favorite of the season thus far. All that and more on this week’s episode of the Final Say! WLW Studios’ official “Lucha Liaison” Jay Baca joins Handsome Dan again this week for his review of Lucha Underground Season 2, Episode 2: The Dark & Mysterious. There are some new faces in The Temple this season. Come find out what The Smartest Man Not In Professional Wrestling thinks about them. That and more on this week’s episode!